Greaves Cotton, one of the leading engineering companies in India, announced its focus on the farm sector with investments in R&D, plant and people to support the growing farm sector in India. As part of its long term diversification strategy, Greaves Cotton announced the launch of a new locally manufactured power tiller under its Farm Equipment Division. With significant headroom to grow farm productivity in India, Greaves Agri aims to boost mechanization and reduce dependency on human labour in farming, and has unveiled ‘The Bahubali’, the latest addition to its robust portfolio of farming equipment and power tillers. 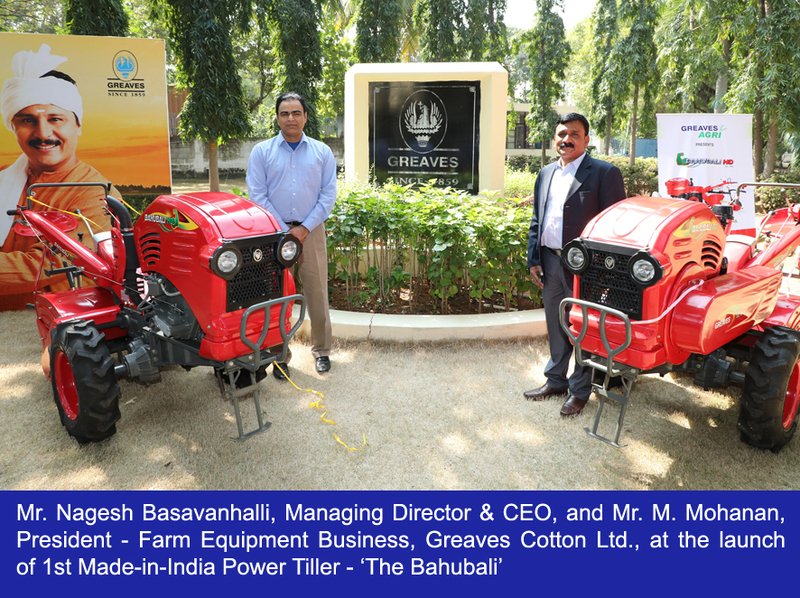 Building on the ‘Made in India, Made for India’ vision, ‘The Bahubali’ is the first ever fully locally designed and developed power tiller by Greaves Cotton in India. With the new high power 14HP engine and heavy duty performance, it offers best-in-class ploughing performance with higher tilling depth, excellent fuel efficiency and a rugged body for long life. Speaking about the launch, Mr. Nagesh Basavanhalli, Managing Director & CEO, Greaves Cotton Ltd., said: “As part of our strategy, we have invested in building capability – people, facility and technology. This will help us strengthen our position in the agri sector, as we cater a wide range of products and services to the farmers to help them right from ploughing to harvesting. With the Indian economy rapidly evolving, there is a need to make efficient use of farm machinery to improve land productivity”. Greaves is working closely with farmers & FPO’s to understand their needs & create farm solutions that promise more yield per acre of farm, especially when we see shrinking landholdings with rapid increase in population & shortage of farm labour in India. Having grown from a small equipment player to a large farm solutions and services company, Greaves Agri has products for each stage of the crop cycle covering a wide variety of functionality for the farm sector. This investment is a part of customer focus at Greaves Agri, with rigorous validation being integral to the process. Its dedicated R&D facility & state-of-the-art large farm equipment factory in Ranipet manufactures wide range of farm products & has been actively engaging with customers across nation. Greaves Cotton provides high quality products across all stages – irrigation, soil preparation, planting, plant protection, harvesting, and post-harvest cycle. To achieve this, it undergoes rigorous testing and validation inside factory and under real world usage pattern tests across various terrains. It has sold more than 3 million pump set across India and neighboring countries. As part of productivity enhancement solutions, Greaves Cotton is taking aggressive steps to bring electric and solar pumps for the segment.